Let’s take out some butter to soften up. Check that your pantry has plenty of flour, sugar and brown sugar. Oh, and we’re going to need peanut butter, peanut butter in several forms. Why? Because today is baking day. Today we are going to make Peanut Butter Oatmeal bars, and we’re pulling out all the stops with these, incorporating peanut butter-flavored baking chips, peanut butter, and Reese’s Miniature candies. Total peanut butter heaven! I’ve been enthralled with all kinds of bar cookies lately, and these leave no room for disappointment. If you have Reese’s Cups left from Halloween this is a great way to use them up. These bars are fabulous in every way; besides the wonderful taste, the centers are perfectly soft and chewy, and the Reese’s cup surprise in the middle makes them even more drool-worthy. It takes very little time to whip these up, but everyone who tastes them will want the recipe. To make sure the Reese’s are nicely distributed I put down a layer of about half the dough in the bottom of the baking dish and then sprinkled the chopped candy on top. Next I dolloped the remaining dough on top of all that, making a kind of peanut butter oatmeal cookie sandwich with a Reese’s filling. Turned out to be a great way to do it, as every bite gives you all that yumminess combined. 1. Preheat the oven to 350*F. Spray an 8-inch square baking pan with non-stick cooking spray. 2. Cream butter and brown sugar together in a large mixing bowl. Add peanut butter and continue mixing. 3. Add egg, mix in well, then add vanilla. 4. Combine flour, oats, baking powder, and salt in a small bowl. Add flour mixture to the creamed mixture and stir in well. 5. Stir in the peanut butter chips. 6. Spread 2/3 of the dough on the bottom of the pan. Top with chopped Reese’s miniatures. Dollop the remaining dough on top by the teaspoon. It doesn’t have to completely cover all the Reese’s. About half the dough on the bottom, a layer of Reese’s cups, and the remaining dough on top. 7. Bake for about 30 minutes. Let cool completely before cutting into bars. Serve with a glass of cold milk for supreme satisfaction!! There are so many words to describe these bars I hardly know where to start. Chewy? most definitely. Crispy? yup, when you bite into a pretzel piece. Sweet? well, of course, they are dessert bars after all. Salty? yes, a little. You can thank the pretzels for that too. And where do I fit in the experience of biting into a gooey melted marshmallow with drizzles of peanut butter and dark chocolate? Do you get the picture, here? There’s so much going on with these bars words can’t do them justice. You’ll just have to make them for yourself to see what I mean. I’m thankful the recipe only makes a 9-inch square pan of these goodies. One square is just enough to satisfy without feeling guilty and makes portion control so much easier. Even better, bars are so easy to share! I’ll be willing to bet that if you do decide to share these, you’ll get requests for the recipe. 1. Position a rack in the middle of the oven and preheat to 350*F. Line a 9 – inch square baking pan with foil, leaving a 2 – inch overhang on all sides. Lightly spray the foil with cooking spray. 2. Pulse 1 cup pretzel pieces in a food processor until finely ground ( you should have about 1/2 cup crumbs). Transfer to a bowl. Whisk in the flour, baking powder and salt. 3. Melt the butter in a saucepan over medium heat. (or in the microwave) Stir in the brown sugar. Let cool slightly, then stir in the eggs and vanilla. Stir the pretzel crumb mixture into the butter mixture in two additions. Mixing in the dry ingredients. 4. Spread the batter in the prepared pan. Scatter the remaining 1/2 cup pretzel pieces on top. Bake until golden and a toothpick inserted into the center comes out clean with a few crumbs, 25 – 30 minutes. Let cool completely in the pan on a rack, then ligt the foil to remove the bars from the pan and transfer to a baking sheet. After baking, just out of the oven. 5. Preheat the broiler. Press the marshmallow halves, cut-side down, in even rows on top of the bars. Broil, rotating the baking sheet as needed, until the marshmallows are golden brown, 1 to 2 minutes; let cool. 6. Put the peanut butter chips and 1/2 teaspoon vegetable oil in a microwave-safe cup or small bowl and microwave in 30 – second intervals, stirring, until melted and smooth. Repeat with the chocolate chips and the remaining 1/2 teaspoon vegetable oil in another bowl. Drizzle the melted peanut butter and chocolate mixtures over the bars. Let harden at room temperature or chill to set before cutting. Do you like Banana Bread? I do. I think most people do. How about Banana Bread with Chocolate Chips in it? Yes? Me, too. How about Banana Bread with Chocolate Chips in it and –wait for it—- Peanut Butter? WOW! Do I have your attention now? Well, this recipe certainly grabbed my attention, and I only found it because I cleaned my bookcase. There fallen down behind several bigger books was an old issue of Taste of Home magazine, March, 2009. I knew when I found it that I must have kept it because of some recipe that appealed to me. Sure enough, the turned down page indicated bread recipes that had won a contest. ( 12 of them!) They all looked so good, it would have been a hard decision which to make first except that I had two ripe bananas, and all the other ingredients on hand, so that was the decision maker. The smell of this bread baking is heavenly and anyone at home when you make it will come running to find out what smells so good and when they can have some. 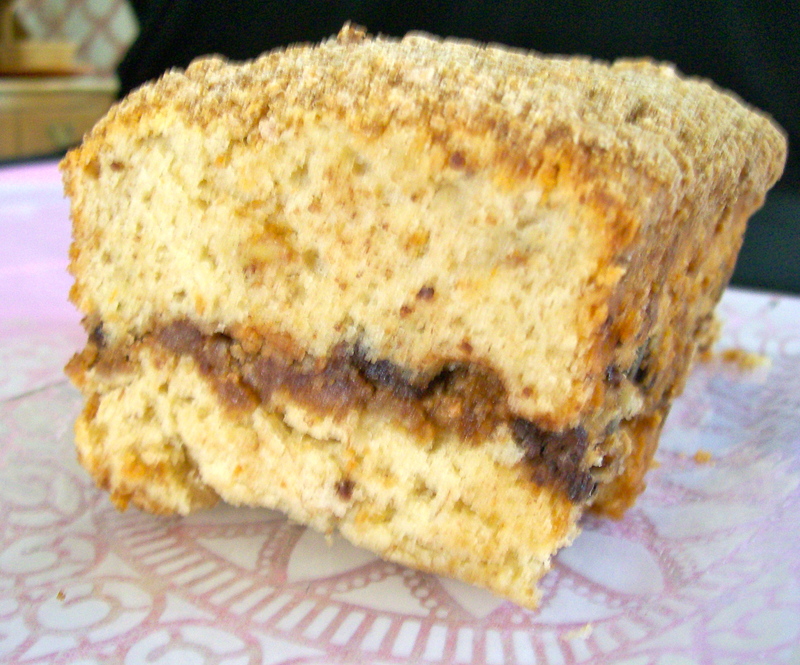 It has a layer of crumb topping and melted chocolate chips in the middle, and more crumbs on top. Every bite is scrumptious! The recipe makes 2 loaves; 8 inch x 4 inch pans. In a small bowl, stir together the flour, brown sugar, and cinnamon. Add the peanut butter, and using a fork, mix in to form a crumbly mixture. Set aside. In a large bowl cream the butter, cream cheese and sugar until light and fluffy. Add eggs, one at a time, beating well after each addition. 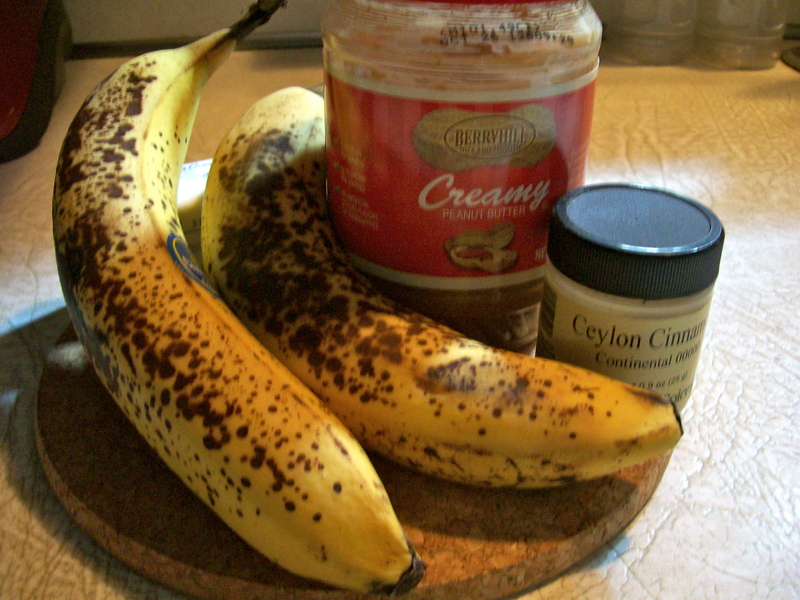 Beat in bananas and vanilla. Combine the flour, baking powder, baking soda and cinnamon; Stir into creamed mixture just till moistened. Divide half the batter between two greased 8-in. x 4-in. loaf pans; sprinkle with half of the topping. Top with the chocolate chips. Repeat layers of batter and topping. Bake at 350 degrees for 45-55 minutes or until a tester inserted near the center comes out clean. Cool for about 10 minutes before removing from pans to wire racks to finish cooling. From My Experience: If you do not have the exact pan size, go a little bigger rather than smaller because this is a fairly large recipe and pans will be full. 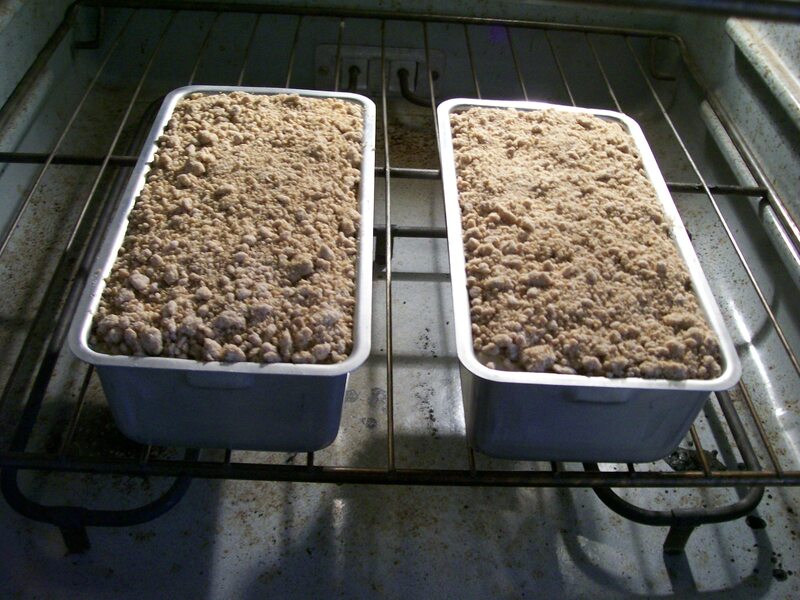 Also use more than half the crumb topping in the center of the breads, and less for the crumb topping. I split mine in half as directed and as the bread rose in the oven the crumbs fell off and burned on the oven floor. More crumbs fell off as I tried to get the breads out of the pans. Finally, I would suggest using mini chocolate chips so they melt during baking. My chips were the large size and they remained whole instead of melting . Everything tasted wonderful, but these were the problems I encountered. 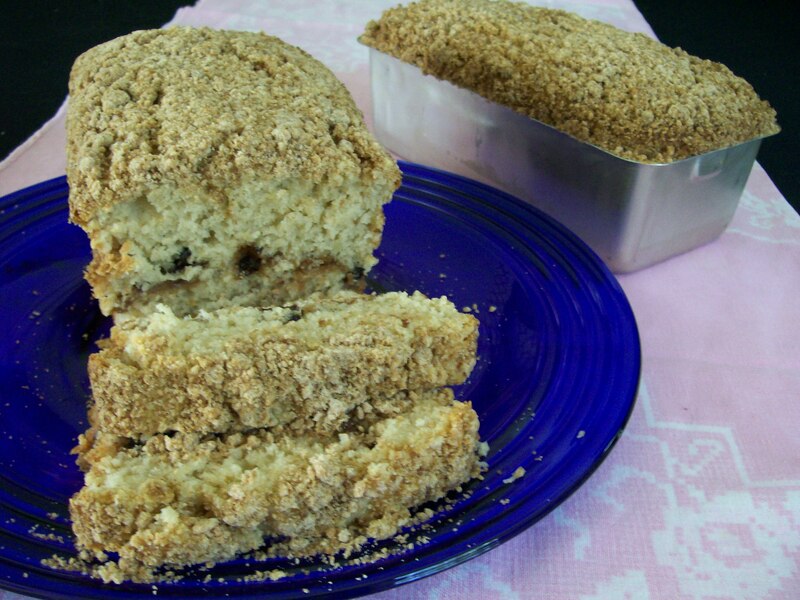 The recipe was published in the Winter 2012 Baking Sheet, from King Arthur Flour. I am a faithful subscriber to this little recipe-filled periodical many of which have turned down pages for recipes I want to try. Mention Mississippi Mud and like the ice cream, I think of chocolate chips, nuts and peanut butter. These bars have not one, but two kinds of chocolate: dark and white, plus pecans – a Southern touch. Pure deliciousness in one little cookie bar. Since they are eaten with your hands it’s OK to lick your fingers! A word here about pan size: You may choose a 9”x13″, a 9″x9″, or an 8″x8″ pan. The smaller pans will produce 16-20 bars that are thick with a thick layer of chocolate on top. The 9″x13″ pan will produce 24-32 bars, but only about an inch thick. That’s the size I used to bake the bars pictured here. Preheat oven to 325 degrees. Select your pan and grease generously with non-stick spray. Cream the butter and brown sugar in a large bowl until smooth. Beat in the peanut butter followed by the egg and vanilla. Mix well; scrape the bowl. 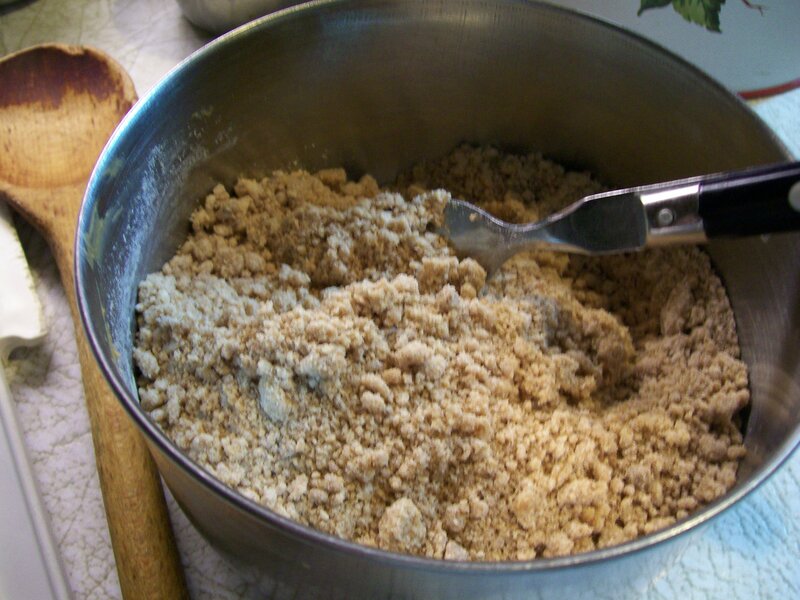 In a small bowl, mix together the flour, baking soda, and salt. Stir the dry ingredients into the butter mixture. Add the white chocolate, 1 cup of the semisweet or bittersweet chocolate, and half of the pecans. Spread the batter evenly in the prepared pan. Using a spatula works well to spread it to the edges. Bake for 40-45 min. for 8″ or 9″ square pans; 30-35 min. for the 9″x13″ pan. The bars should be golden brown all over. 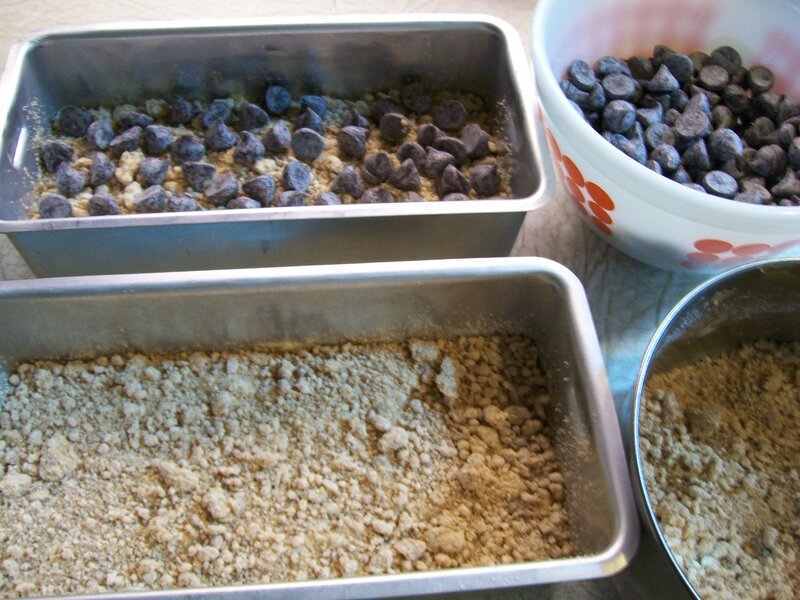 Remove from the oven and immediately sprinkle the remaining chocolate over the top of the bars. Return to the oven for 1 minute to soften the chocolate, then take the pan out of the oven and spread the now-melted chocolate evenly over the top. 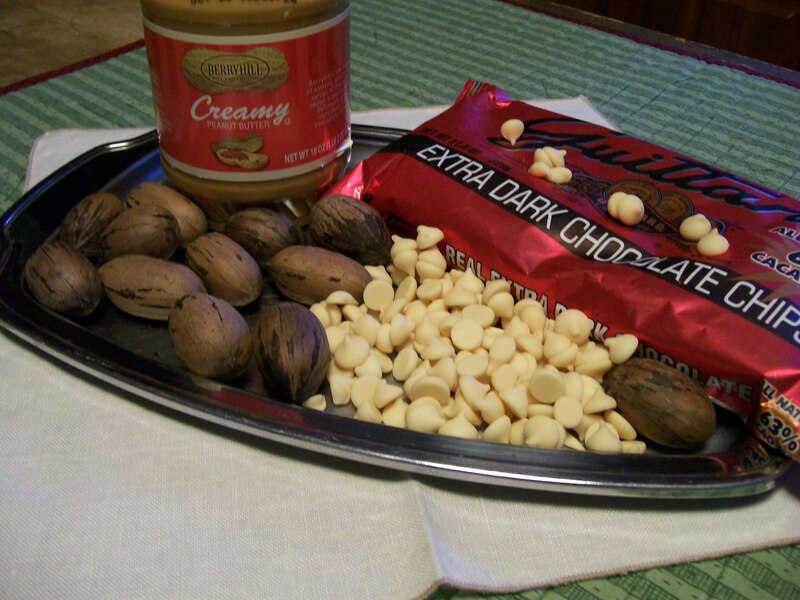 Sprinkle with the remaining pecans, pressing them lightly into the chocolate. 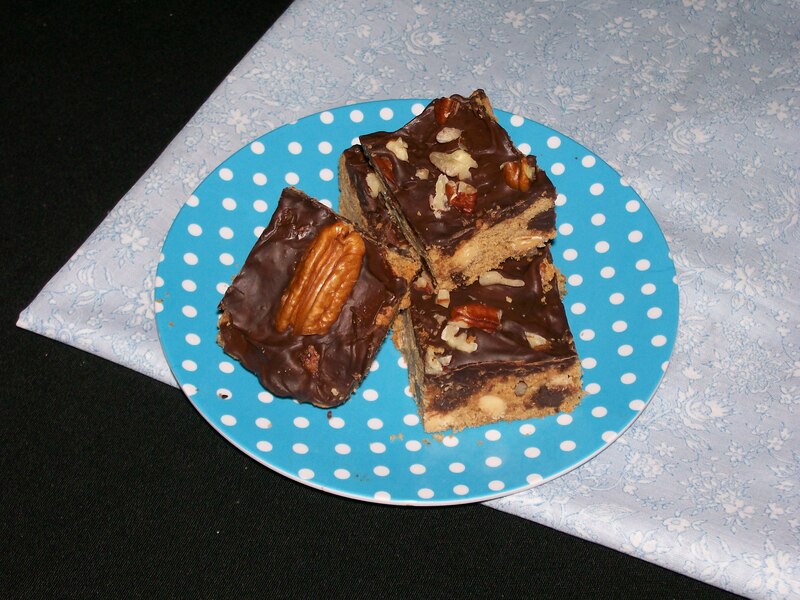 Allow to cool before cutting into bars. The heat of summer has arrived ! In winter I wish for the warmth of summer, and in summer I’m looking for some relief from the heat. One day last week when I was out doing a few errands I noted on the time and temperature clock at the bank that the temperature was 106. Yikes!!! What am I doing out in this heat? Let me get home quickly to some air-conditioning and a cold drink. There is nothing so satisfying as unwinding with a frosty cold milkshake. However most of the milk shakes I’ve ever known carry a lot of calories–hidden way down there at the bottom of the glass. So, I decided to put my milkshake on a diet by seeing if I could cut some of the calories and still maintain its cold, satisfying goodness. Here’s what I did: for half of the ice-cream I substituted vanilla non-fat Greek yogurt, which still made it creamy and thick. For the milk I used non-fat milk and added 2 tablespoons of chocolate syrup, and then I also added 2 tablespoons of peanut butter. All the flavors of a peanut-butter cup candy. HMmmm! How about if I add one or two. My first instinct was to throw them in the blender with the other ingredients, but I restrained myself and settled for garnishing the glass with one candy and biting off little pieces in between refreshing sips. Pretty darn good if I do say so. Chill a tall glass. 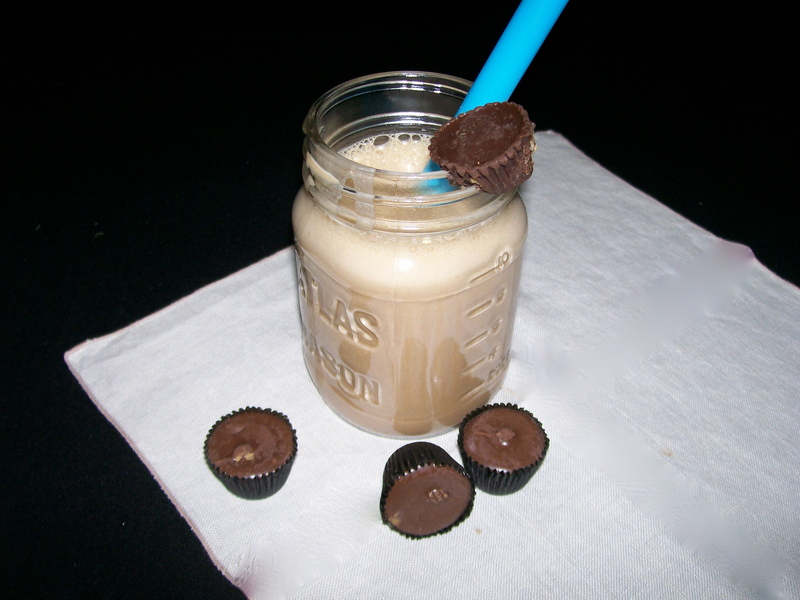 Place milk, ice-cream, yogurt, chocolate syrup, and peanut butter in a blender container. Process until its thick and creamy. Pour into chilled glass and sprinkle with crushed candy or slide one over the edge of the glass to garnish. Make one—-you won’t be sorry! 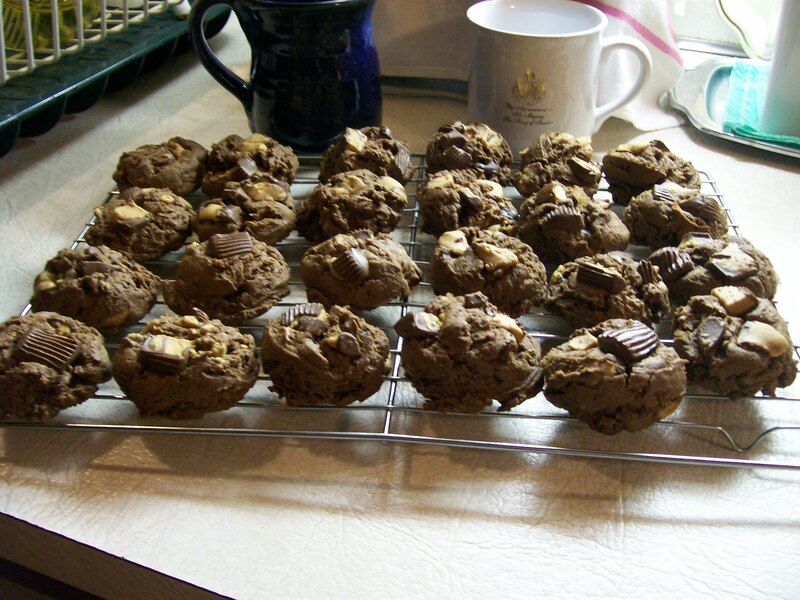 OMG, I think these are the BEST chocolate cookies I have ever made! Warm from the oven Mr.D and I ate a total of six. Of course, as I have previously stated chocolate is my absolute favorite in any kind of dessert. 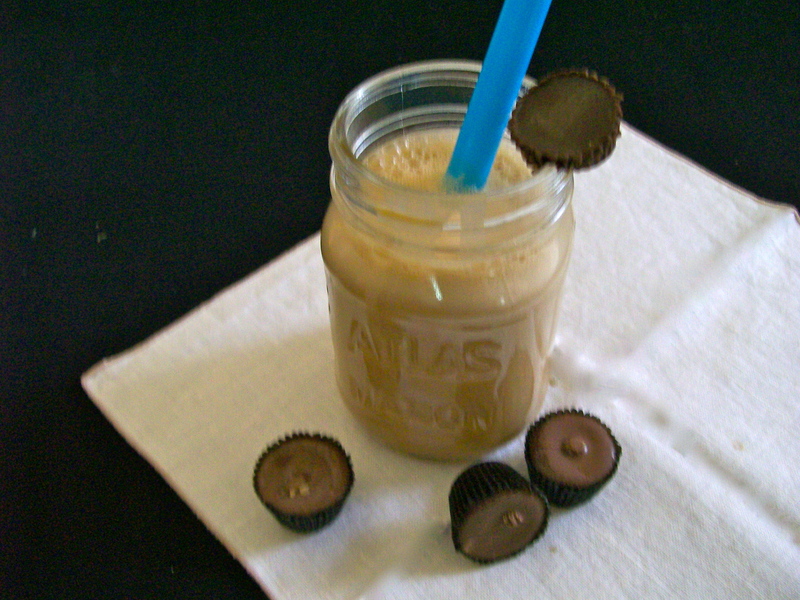 With these the addition of chunks of Peanut Butter Cup candy takes them well over the top. The cookies are a generous size, moist and chewy, and very rich. The recipe predicts a yield of 16 large cookies, but I used a smaller cookie scoop, and got a total of 30 cookies that were still good sized. Plus my conscience is more forgiving if I have more than one of these. Before you begin, place the peanut cup candies in the freezer for about 30 minutes. This will make chopping them easier, and helps keep them intact while mixing into the dough. You will need about 2 cups, chopped. Preheat oven to 350 degrees. Grease 2 large baking sheets or line with parchment paper. Mix in dry ingredients just to incorporate. Fold in 1 1/2 cups coarsely chopped peanut butter cup candies. Use a large cookie scoop and drop mounds of dough 2–3 inches apart. Gently press a few pieces of candy into tops of dough balls. Bake 12 – 14 minutes. (They may seem too soft coming from the oven, but they will set up as they cool.) Do not over bake them! Let cool about 10 minutes, then transfer to a wire cooling rack to finish cooling. Store airtight.